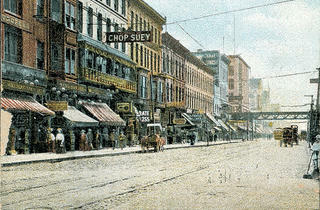 The city's first Chinese-American enclave was in the Loop. Today, the intersection of Cermak Road and Wentworth Avenue is synonymous with Chinatown, home of some 70,000 Chinese-Americans. On that corner sits the ’hood’s visual anchor, the ornate Pui Tak Center. But from 1870 (when the transcontinental railroad became active) until the first decade of the 20th century, Chinese immigrants from the West Coast flocked to a different crossing in Chicago: Van Buren and Clark Streets. The area was flush with railroad depots, including Grand Central Station at Harrison and Wells Streets, which made it prime space for business. “The Chinese that first came to Illinois were mostly urban Chinese. They weren’t miners, railway builders or farmers,” says local historian Chuimei Ho, co-editor of Chinese in Chicago: 1870–1945. “They did business. 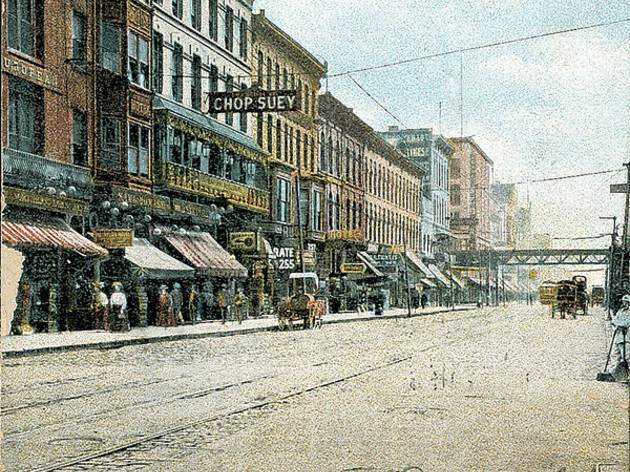 They were restaurateurs, grocers, launderers.” Among the Chinese-owned businesses along Clark Street between Van Buren and Harrison, according to an 1889 Tribune report, were eight grocery stores, two drug stores, two butcher shops, two barber shops, a cigar factory and a restaurant. “One of the last Chinese-related businesses in the old Clark Street Chinatown was a small restaurant that disappeared probably by the 1980s,” says Tim Samuelson, Chicago’s official cultural historian. The site now houses a Mexican restaurant, La Cocina (406 S Clark St, 312-922-8211), which has a sign in the shape of a Chinese pagoda—one of the final reminders, Samuelson says, of the city’s first Chinatown.